What is Kinesis Project's PARK DANCES? Kinesis Project loves to dance in beautiful, messy and wild spaces. It is part of our company mission to "push the boundaries of what changes space, and people, by placing movement and stillness in unusual and inspiring places." Since 2001 Melissa & Kinesis Project have placed dances uptown and downtown in NYC, New Jersey and Pennsylvania and produced over 30 outdoor performances! Imagine walking in the park and glancing across layers of flowers to see a beautiful duet occurring on a walkway,or four dancers trying to share space on a bench in a hilarious pile... Or, finally, wandering into Battery Park on a lunch break and seeing dancers freely performing in the fountains. 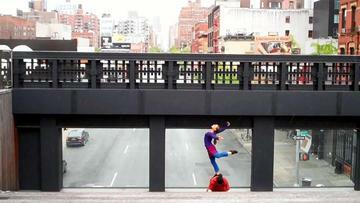 Kinesis Project brings moments of laughter and beauty to the every day bustle in New York, and we believe it should be available, free of charge, to any one in need of a moment of dance in their day! Kinesis Project is a dance organization that produces dance concerts, facilitates educational programs and creates site specific performances with diverse communities. Kinesis Project builds work designed to make the soul dance and the feet fly. We are pushing the boundaries of what changes space, and people, by placing movement and stillness in unusual and inspiring places.